Isem Ego Phase review | What Hi-Fi? The Isem Ego Phase CD player is a frustrating mix of the great and the grating. We’re all for distinctive design, and the Ego Phase 4 duly delivers that, as it does (for the most part) when it comes to sound. However, this player is let down by a series of ergonomic and build issues that have no place in a machine sold at this price level. It starts with poorly machined corners on the front panel coupled to insubstantial casework, and continues with one of the least intuitive remote handsets we’ve ever encountered. Matters are not helped by the remote control’s vague button action – and you have to use that remote: Isem insists on having just one control on the front panel to operate all functions. Even after an extended period of use we never felt sure of which combination of press and twist would accomplish the task we wanted. Last moan: that nice-looking top loader lid drops with all the grace of a drunken hippo, wrecking the impression of well-engineered quality. The shame is that once past these annoyances it becomes clear that the Ego Phase 4 is actually a pretty good CD player. It’s as distinctive a piece of design as we’ve seen at this price. It’s certainly a welcome change from the 43cm wide rectangular boxes we usually encounter. More than that, it’s the sound that pleases. 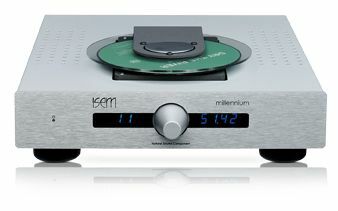 The Isem’s sonic presentation has a boldness and solidity that’s rare to find in CD players. It sounds immensely confident, even when confronted by challenging recordings such as Tchaikovsky’s 1812 Overture. The CD player’s dynamics are strong, as is its sense of refinement. The Phase 4 refuses to harden up even with aggressive sounding recordings, and that’s a real bonus if you have a varied collection. That said, we don’t think the Isem has the outright insight or subtlety to justify a price premium above players such as Audiolab’s 8200CD or Cyrus’s CD6 SE2 – both these machines are around £500 less in price. It’s also no rhythm champ, lacking the rhythmic thrust needed to make song like Kanye West’s Monster come to life. Factor in the Isem’s usability and build issues, and the case for recommendation becomes difficult to justify.